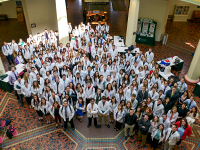 Student pharmacists, residents, and faculty from Duquesne University School of Pharmacy will travel to the State Capitol in Harrisburg, PA on Monday, April 16, 2018 to attend the Annual Pharmacy Legislative Day. Students will meet with state representatives and senators to discuss pending legislation relative to healthcare and pharmacy practice. Students will also attend special meetings with Dr. Rachel Levine, Secretary of Health and Physician General; Attorney General Josh Shapiro; and Auditor General Eugene DePasquale. Joined by pharmacists and student pharmacists from across the state, attendees will push for expansion of pharmacist immunization services, promotion of medication synchronization services, fair reimbursement, and prohibition of gag clauses pharmacy benefit managers (PBMs) contracts. In addition to advocacy efforts, students will have the opportunity to demonstrate the types of patient care services that pharmacists can provide by offering carbon monoxide screenings, Tanita body composition screenings, and tobacco cessation information.